Paul’s surgery was quite the experience. We dropped Joseph off at a friend’s house and went to the hospital. They got him checked in and then we waited for almost two hours before they called him back. I hung out in the family waiting room until the surgeon came to tell me that the procedure went well. They fixed the hernia and everything was okay. After Paul had a chance to wake up a bit more, we got his pain meds and headed home. 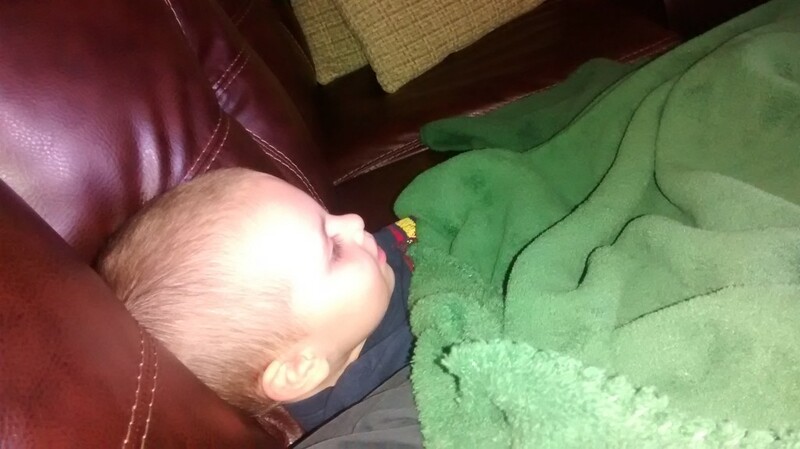 I got him settled in before going to get Joseph. Now the real adventuresome part. About 7:30 that night, Paul noticed that there was quite a bit of blood under his dressing (in fact, blood started dripping down his leg). It was then we realized that they didn’t give us any replacement dressings (since I didn’t know to ask and Paul was understandably too out of it to ask). We called the after-hours nurse line and they said that we should go to the ER just to make sure that there wasn’t too much bleeding going on. We loaded Joseph up (including jammies, his blanket, and his two favorite stuffed animals) and dropped him off at another friend’s house (after calling ahead to explain the situation). She said he was welcome to stay all night since they had a pack n’ play that he could sleep in. It was good that she said that, because we were at the ER for seven hours. We got checked in, waited several hours, got into a room, waited several more hours, and then the ER doctor came in, looked at it, and said that it was okay, we just needed a fresh dressing. The nurse then came in, changed the dressing, showed me how to do it in case I needed to at home, and sent us on our way with plenty of supplies. I don’t know why they neglected to do that after the surgery (even though they said they did. huh). We got home around 4:00 A.M. and I sent my friend a text message to see how Joseph was (she’s got a nursing baby, so she is up feeding him during the night sometimes). She said he was doing great, so I went to bed for a couple of hours before going to get him. After I picked him up we went grocery shopping because I knew the next few days would need to be spent taking care of my boys. 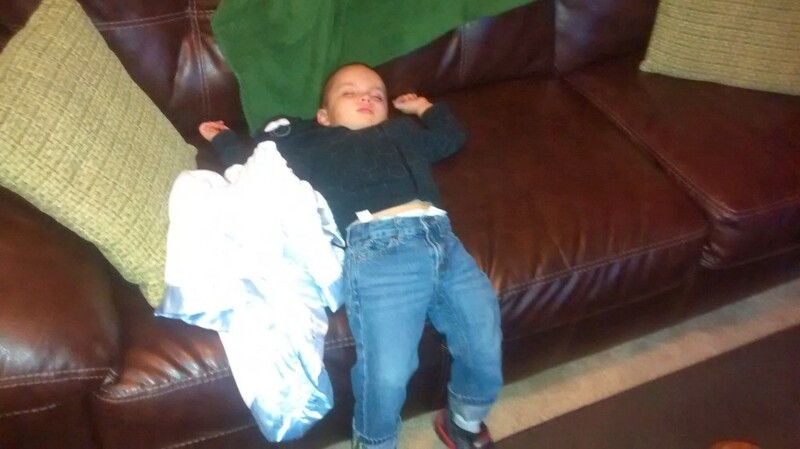 Joseph was so exhausted from his first sleepover (haha) that he fell asleep on the way home from the store and did NOT want to wake up. The rest of the week has been filled with piano lessons, taking care of the patient, and caring for the rug-runner. The other adventuresome part of Paul’s surgery happened when we got the surgery report back. I remember vaguely the surgeon telling me that they removed something, but his accent was so thick and he was using such technical jargon that I didn’t catch it. Reading the surgery report, we found out that they removed a lipoma. To us, that sounded like cancer! We’re starting to freak out (especially since they hadn’t told us in detail about this), but then noticed a hand-written note that defined it as a benign, fatty tumor. So no cancer. Whew! We’re both a little ticked that they didn’t mention this in more detail, but since everything is okay, we’re moving on! Paul is up and about (though still moving a bit slower than he’d like…we think that the trip to the ER probably did nothing good for his recovery). He’s going to take at least one more day off to recover. The Weekly Weather: This week we’ve had some rainy days (at the beginning of the week) and then it wrapped up nice and mild. I think spring’s on its way! 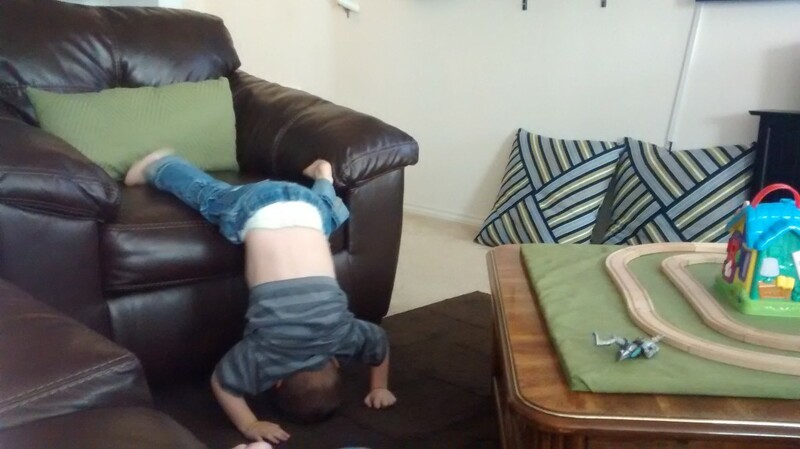 Funny/Cute Stories: Joseph is very interested in Paul’s “owie” and asks to see it often, so Paul will show him the bandage. He seems very concerned, but since Daddy looks okay, he;s not too worried. We have to constantly remind him that he needs to be soft with Daddy until he gets better. Joseph had a blast playing with friends during the times that I had to drop him off at friends’ houses. The other day, I made cookies to take to both of them as a thank you and he was very disappointed that we weren’t going to stay. Methinks I need to plan more play dates! There are a couple of shows/movies that we’ve seen enough times that Joseph can repeat words right along with it (including sound effects). It makes it less monotonous if I watch how into it he is. Today at church, Joseph decided he wanted to sing along as the hymns were being sung. 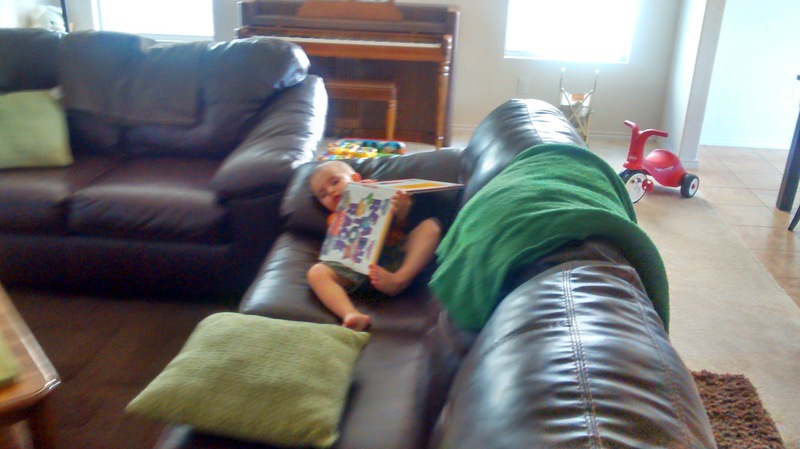 He started singing along, using whatever words he saw fit (like backwards, cars, etc.) or just saying “ahhhhhh” along with the music. Pretty cute! This is what happens when Momma drags you grocery shopping after your first sleepover (my friends mentioned that he didn’t sleep very well. He was sad when it was time to go to bed, but was willing to snuggle her and then fell asleep. He spent most of the night in the pack n’ play, but spent some of the night in her bed, snuggled up for comfort. He was rather glad to see me). As I was picking up Joseph the morning after the ER craziness, my friend (who’s house he stayed at) said she wanted to bring us dinner that night. 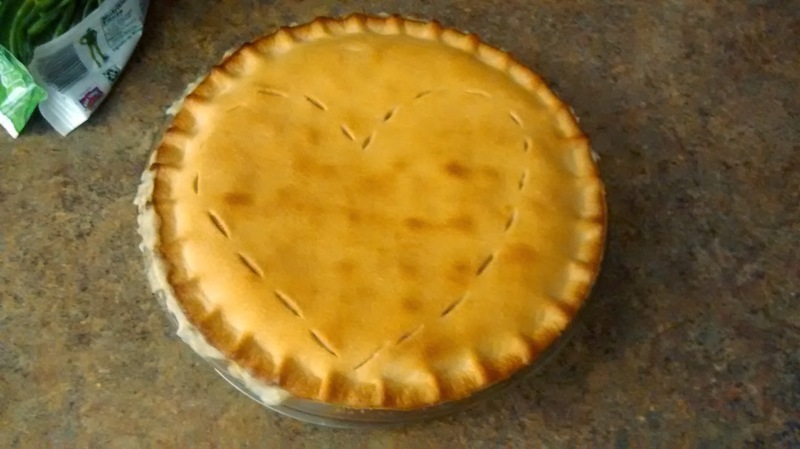 I just about cried when I unwrapped this piping-hot, home-made chicken pot-pie and saw the heart. I love the friendships that I am forming here! 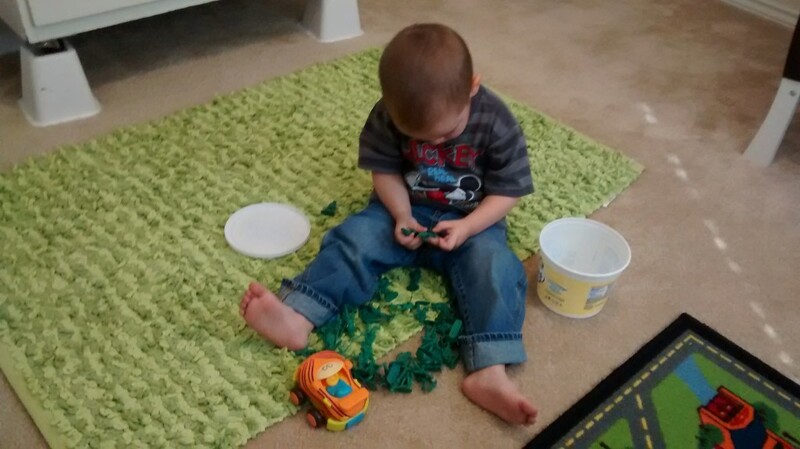 He was playing so intently with his Army men that he didn’t even notice me taking the picture. 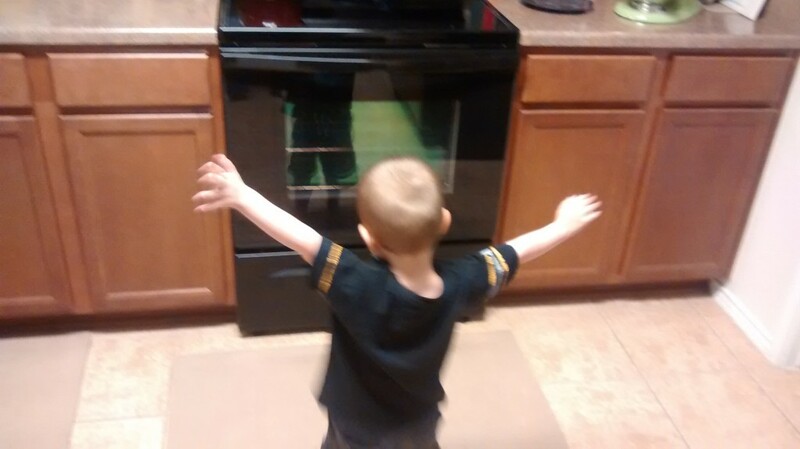 He discovered that he can see his reflection in the oven door. 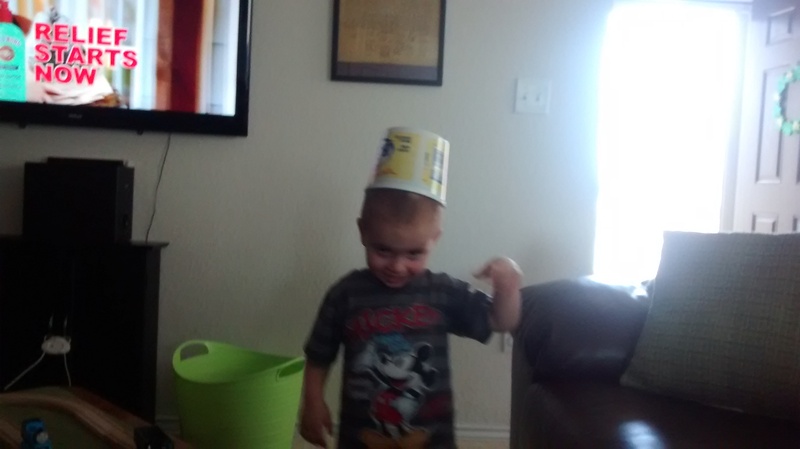 In this shot, he was saying that he was an airplane. He also kept looking over his shoulder as he walked away so that he could see himself from behind. We got in quite a bit of snuggle-time this week. Right before Paul had his surgery, he planted some tomatoes and some cilantro. I’ve been watering them every day. 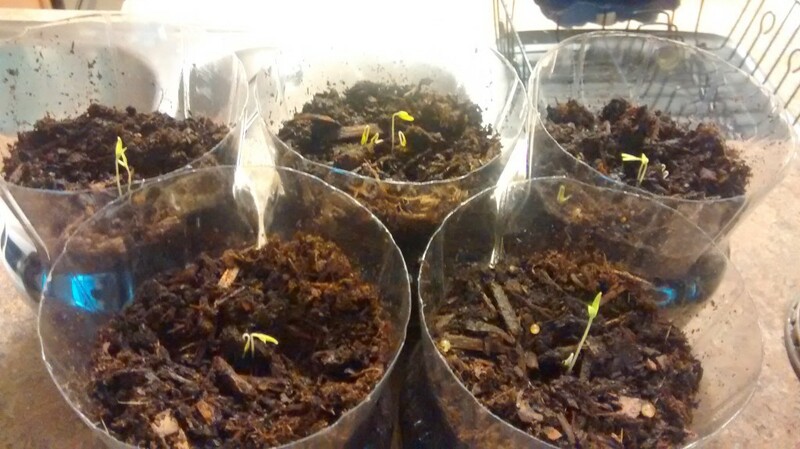 I don’t have pictures of the cilantro, since it hasn’t sprouted yet, but I was pretty excited to see little tomato plants popping out of the soil.